These creatures have 8 legs, a large crystal on their back, and emit a distinctive sparkling (crystal-like) sound when nearby. When they spot you, they will attempt to run away, burrow and vanish1. They carry upgrade materials, rewarded to the player if killed before vanishing. The materials will be added to your inventory automatically. They behave almost identically to Crystal Lizards in Demon's Souls, but appear different. 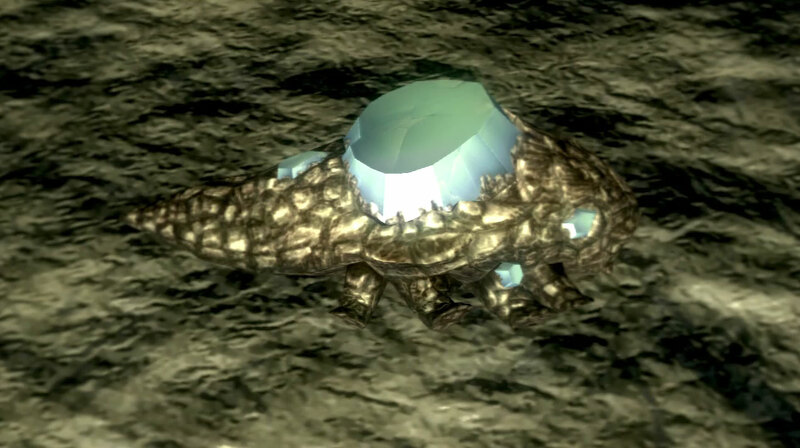 The only confirmed difference in game mechanics from Demon's Souls is that there is no counter-system that can cause the Crystal Lizards to respawn or disappear permanently after vanishing. Instead, a Crystal Lizard will never respawn after being killed, but they will always respawn upon reloading if you miss them. This means you can only kill each Crystal Lizard once, but you have unlimited opportunities to do so. Hidden in a barrel directly before entering the Taurus Demon Bridge. In the area after the first rotating spike bridge, there is a room with a pitfall trap (a patch of odd looking dirt near the middle). Dropping down leads to a corridor lined with spike statues. Avoid the spike traps to prevent getting locked in hit-stun, which will allow the lizards to burrow away. The second lizard is much harder to reach before it gets away. Ranged attacks or the quitting/ reloading method are recommended. Also note that there seems to be a glitch where the lizard won't spawn if you died in this corridor. Collect your remains and try again. In the tunnel where the golden fog door once was, in the area where the skull lantern is no longer needed. If you are in human form then this is the section that will notify you that Leeroy has invaded. From the bonfire walk off the ledge to your right and drop onto the first branch. At the end of this branch you can drop into an alcove for lizards #1 (at the ledge) and #2 (inside). Back on that same branch, a little ways before the alcove listed above, you can drop to another cave entrance for lizard #3. From the bonfire again, follow the tree branch, never falling. Lizard #8 will be found where two branches pass next to each other. Easiest way to find lizards #9 and #10 is to follow that same branch, they will be on a ledge below. Or, from the ledge with a ladder, follow the only branch up. The first ledge you come to will have lizards #9 & #10. On the switchback cliffs leading down to the Darkroot Basin. At the shortcut guarded by a respawning Prowling Demon. It is behind him and near the top of the stairs leading to the Demon Ruins/ Lost Izalith Shortcut. Three can be found by turning around after dropping onto the last invisible walkway before the boss. In the hallway before the Seath the Scaleless first encounter. One can be found halfway through, shortly after you cross the bridge into the second half of the main area of the Royal Wood. The second can be found on the northern ridge of the second half of the Royal Wood, just east of the first usable elevator down to Marvellous Chester and the Knight Artorias fog gate (not the shortcut elevator). The third can be found by dropping down onto the first platform to the left of the waterfall in the Black Dragon Kalameet boss fight area. On top of a house near the first light-revealed illusory wall (the one hiding the room containing the Silver Pendant). At the beginning of the first big open area (the one with all the Bloatheads and the Dark Bead sorcery). Listen carefully to their distinctive sound, indicating that one of them is in the area. Move slowly and if you spot it try to hit it as fast as you can or it'll disappear. Every time they're hit, it will cancel their burrowing attempt. This will prolong their escape attempt even if they're taking low damage. The Slumbering Dragoncrest Ring as well as the Ring of Fog will help with getting closer to the lizards before they start to flee. Especially helpful for certain lizards that often run before the player typically spots them. If you have strong long-ranged attacks (e.g. Dragonslayer Greatbow, Crystal Soul Spear, Homing Crystal Soulmass), you can one-shot them before they can even run. Equip Bellowing Dragoncrest Ring and Crown of Dusk to ensure high damage with sorceries. As the materials is given to you automatically, you don't have to worry about them falling off a ledge. Knocking them off ledge is even a viable option as it kills them. 1. If a lizard gets away it will respawn when you visit the bonfire, but it will also respawn if you quit the game and reload. With the latter method it is possible to hunt lizards easily, if you quit/reload game by their spawning points. 2. The lizards in The Great Hollow don't always spawn on a reload, so multiple reload attempts may be needed. 3. Any of the Great Hollow lizards can drop titanite slabs, and the odds are somewhere around 10-20%. A player could find as many as ten slabs here in a single playthrough, but will more likely find one or none at all.